Ein Hod is one of those pleasant and quaint towns in Israel that is visited way too infrequently, I think. It is a drop off the beaten path, and somewhat less known. But I think it makes a perfect cultural pairing with a visit to nearby Zichron Yaakov. Both are quiet and picturesque mountain towns in the Carmel with older buildings and great views. But what makes them pair well is the cultural aspect. One of the major attractions of Zichron Yaakov (though far from the only one) is its wine. In addition to the large-scale Carmel Winery, there is also the smaller yet still popular and good quality Tishbi Winery. Combining a winery visit with a stop in at the Ein Hod artists’ colony can make for a lovely half day. Other logical stops in the area to fill out the day include Caesarea, Atlit and Haifa. There are many artists’ villages in Israel, including but not limited to Old Yaffo, Jerusalem’s Chutzot HaYotzer and the old city of Tzefat. I’m not enough of an expert to say whether the art at Ein Hod is of a higher caliber than that at the other sites. But I will say that the atmosphere there is unlike that at any of the other colonies. And as an added benefit, shopping in Ein Hod can help some people in need, as Ein Hod was partially damaged in last year’s Carmel Mountain forest fire. I just noticed your post now. 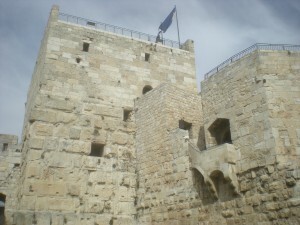 I think it is the Phasael tower at the tower of David.